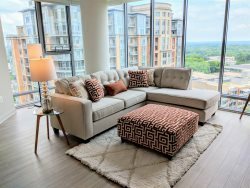 This 2 bedroom and 1 bath corner apartment is located on the 15th floor and offers amazing views over Tysons and towards the West. With over 900 sq ft, this space perfect for a young family or couple who expects guests! A balcony off the master bedroom is an extension of the serene apartment, perfect for daydreaming and lingering over coffee. It's pretty simple really. All we ask is that you treat this apartment and our furnishings as if you owned them and respect the building residents and staff. No Smoking: All Dwel apartments are 100% smoke free and there is a strict no smoking policy. Smoking is not allowed in the apartment, on balconies or on any part of the property. Violation of this policy will result in a $500 fine and possible eviction.